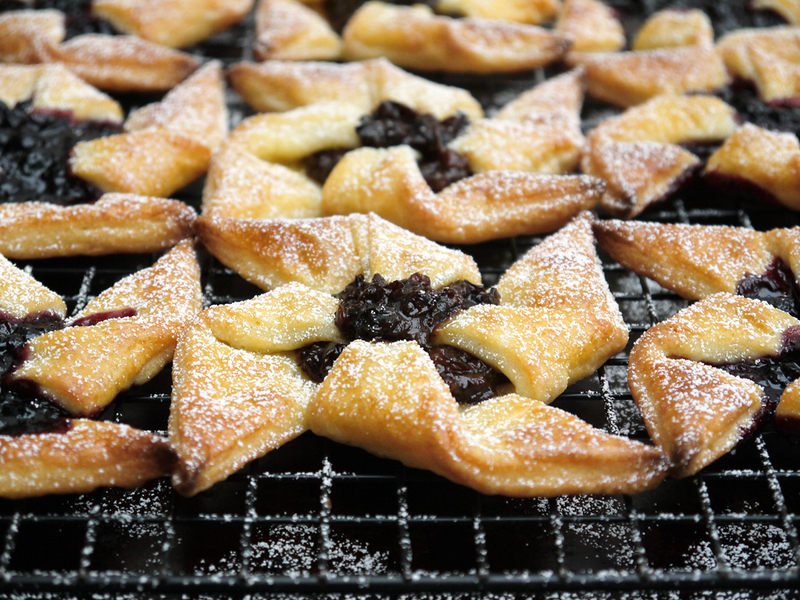 Christmas treats are often all about cakes or cookies, but today’s recipe is one from that forgotten part of the baking world…Christmas pastries! 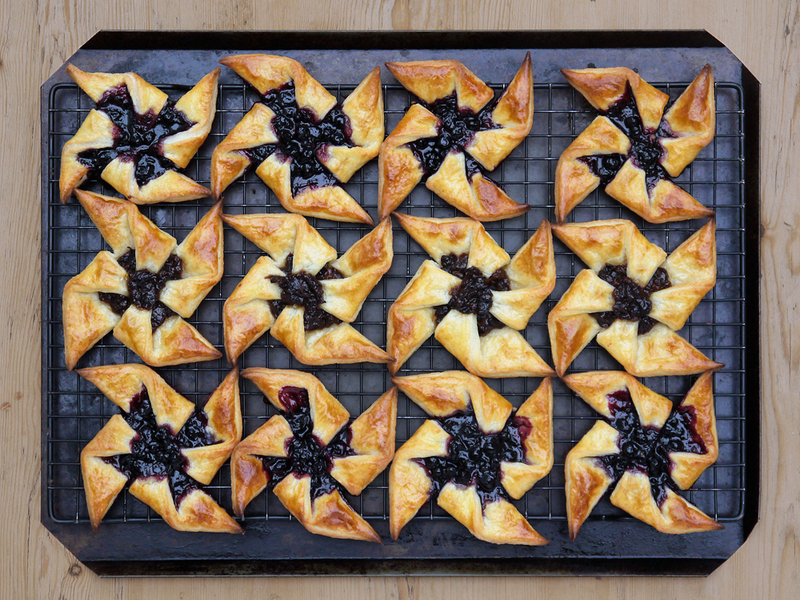 The traditional way to make these pastries is with plum jam or prune filling. I had a look in my cupboards at home, and while I have plenty of jars of jam, I’m lacking anything made with plums. I went for the next best thing – a jar of blueberry jam, which I reasoned was suitably Nordic to be able to pass off as vaguely authentic. I also made some prune filling as a test – I just chopped up some prunes, then cooked them with water, cinnamon, orange juice and some brandy. In the first picture, I’ve used the jam in the top and bottom rows, and the prune filling in the middle row – you can see the different textures. There are actually a few different ways to make these little guys. If you are feeling lazy, or are busy, or have pets/small children, then it is quite acceptable to buy a sheet of puff pastry and use that as the basis for the stars. Just be sure to make good, clean cuts so that you get lots of puffing at the edges. I, of course, opted for a more challenging version. I’ve used a pastry recipe from the Nordic Bakery cookbook. It suggests using a really rich pastry that is made with a decadent amount of butter plus the same amount of quark to bring it all together. I’ve never worked with a pastry like that, so I wanted to give it a go. However, I didn’t have quark to hand, and being too lazy to make the short walk to the main street, I swapped it for some skyr. 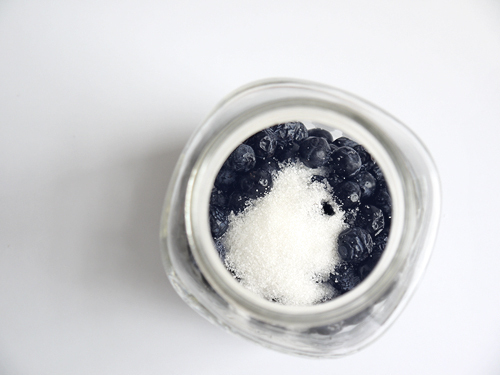 This is a high-protein and low-fat type of yoghurt which originates in Iceland (and those Icelanders take it very seriously, swearing that the stuff you get in Britain isn’t anywhere near as good as the real thing…well, I like the stuff here just fine, and it worked in my recipe!). The dough is very soft, and at first I thought it would not work. But I wanted to believe, so I assumed the flour would soak up some of the moisture, and after chilling it overnight, the pastry was indeed perfectly workable. It rolled out easily, and it was straightforward to cut and form into those classic windmill shapes. Now, the real magic was in the baking. The pastry? Just wonderful. As it has a high butter content (made with equal weights of butter, skyr and flour), it is rich, soft and has a lovely deep golden colour. It is definitely worth the effort of making it yourself. But I do have to warn you – it is a funny dough too. I made my twelve stars from the first rolling of the dough, and they worked perfectly. I then gathered up the scraps and made some more…and boy did they go haywire! It might have been due to the pastry on the first batches being comparatively cool, whereas the later batch was a bit warmer, but they puffed up extravagantly, almost like puff pastry, but they also struggled to bake properly without getting too dark. To avoid this, I recommend working with the dough in two batches, and in each case roll the dough out as square as you are able, so that you minimise any offcuts and can avoid re-rolling the dough. Of my two flavour choices, the spiced prune was nice, but I loved the blueberry. I would happily make that flavour again. If you are making a large batch, you can also use various different flavours – plum is traditional, but apple and cinnamon would work well, and I think something sharp like raspberry would be delicious too. All in all, these Christmas stars from the north were a great success. They are incredibly more-ish. I think I wolfed down three of them in fairly quick succession. They are also at their most delicious while still fresh. They will keep for a couple of days in a tin, but I don’t think you want to delay eating them, and frankly – they taste so good I don’t think you’ll have many hanging around for long. 1. Make the dough. Mix the butter and quark/skyr. Add the rest of the ingredients and mix until it comes together in a dough – the dough will seem very soft. Wrap in cling film and leave to chill overnight. 2. Preheat the oven to 200°C (400°F). Line a few baking sheets with greaseproof paper. 3. Sprinkle a worktop with flour, then roll out the dough thinly – no more than 5mm. Try to get as square a shape as you can. Cut out squares of 10cm x 10cm. Transfer each to the greaseproof paper, leaving some space between the pieces. 4. Make a small diagonal cut about one-third towards the centre of the square from each corner, but do not go all the way. 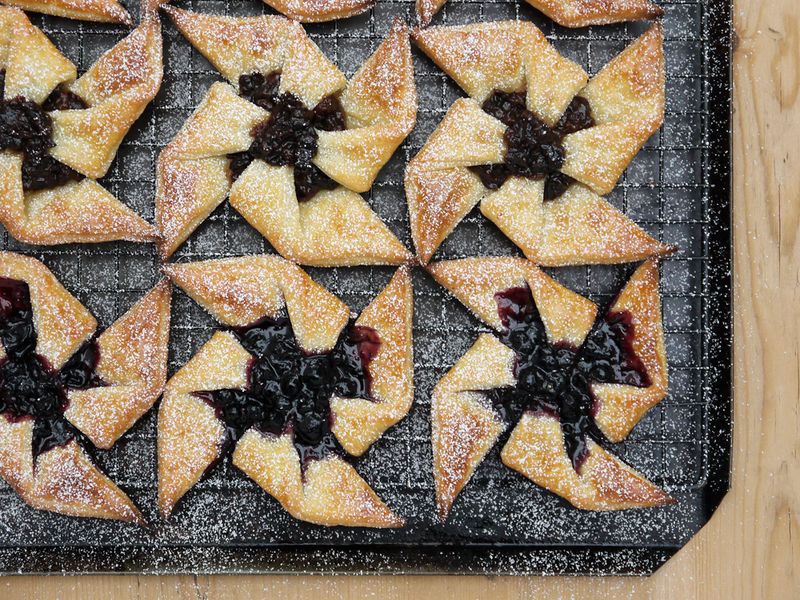 Add a spoonful of jam in the centre, then starting at the top, bring the top-right piece into the centre. Repeat on each side to build up the windmill effect. Secure the overlapping dough in the centre with some water and pinch together, then push down and add a dab more jam to cover. Repeat until you have a full tray (I baked them in batches of 4). 5. Brush each pastry with the beaten egg, then bake for around 8 minutes until a rich golden colour, turning after 4 minutes to get an even bake. 6. When done, remove from the oven, and leave to cool for a few minutes on the paper. 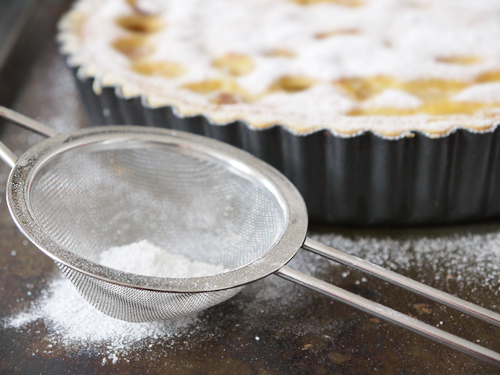 Transfer to a wire rack to cool, then dust with icing sugar before serving. 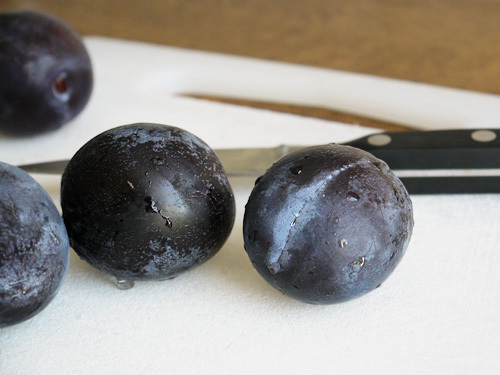 To make plum filling: finely chop 100g of prunes. Add 150ml water and a large pinch of cinnamon. Bring to the boil then simmer until the mixture seems thick and almost too dry. Add a tablespoon of brandy and a tablespoon of orange juice. Mix well and leave to cool. 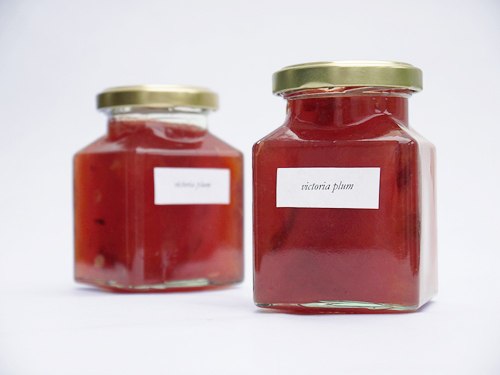 While I’m a big fan of picking wild fruit and doing various things with it (jam or steeping it in alcohol for a winter tipple) I also love good old-fashioned Victoria plum jam. It’s such a bright, jolly colour first thing in the morning and the flavour is delicious on hot buttered toast. Victoria plums are really very pretty fruit. The flesh is a bright golden colour, while the skin is a mottled reddish-purple. Nice, eh? However, when you make them into jam, the colour from the skins infuses everything, resulting in this deep amber colour. This is also a great recipe if you’re a bit of a jam novice. Just take equal weights of plums and jam sugar, boil up with a little lemon juice, and you’re got some fantastic jam to see you through the winter months. If you’re after something extra special, you can add a dash of brandy or plum schnapps to each jar just after potting and before you seal with the lid. But be careful – you don’t want to add more than a couple of teaspoons, otherwise the jam won’t set (and, eh, you probably don’t want too much brandy with breakfast?). One other little trick that I do is to take some seeds from the plums and add a couple to each pot of jam – these had a bitter almond flavour, which will enhance the taste of the jam. 1. First, the boring bit. Sterilise some jam jars(*), and put a plate into the freezer – you’ll need this to test when the jam is set. 2. Rinse the plums. Cut each in half and remove the stones. Throw the fruit into a large saucepan with a little water. Place on a medium heat until the fruit starts to soften. 3. Add the sugar, stir well and then place on a medium heat. Bring to the boil, then keep on a slow rolling boil for around 10 minutes. Add the lemon juice, boil for another minute, then start to check for a set every minute or so – put some jam on the cold plate, leave for a moment to cool, and if it wrinkles when you push with your finger, it’s done. 4. While the jam is cooking, crack open some of the plum stones and remove the seeds. Blanch them briefly by boiling for 30 seconds, and the seeds should slip out of the skins. Split the seeds into two. 5. Once the jam is ready, ladle into the prepared jars, adding 2-3 pieces of the plum seeds. Seal, label and hide it somewhere to enjoy later. (*) To sterilise jam jars: wash with hot, soapy water, then rinse well. Place upside-down in a cold oven, and heat to 90°C for 15 minutes. Leave in the oven to cool down while you are making the jam . To sterilise the lids, wash with hot, soapy water, then rinse well, place in a saucepan with boiling water for 5 minutes. Back in early autumn last year, as we were enjoying an unseasonal heatwave in London – picnics in the park, drinks in the sunshine and balmy evenings. At that time, I posted about my attempts at home-made sloe gin, made with local fruit sourced from some very old bushes growing wild in the local area – the lovely Clissold Park. It’s two minutes from my house – so for the Hackney foodie set, it just couldn’t really get much more local that that! So, today, I present the fruits if my labour, and I can confirm that it’s quite something. The name “sloe gin” is perhaps a little misleading. Gone is the strong flavour of gin, and the mixture is transformed into a marvellous liqueur. It has a fantastic crimson colour and plummy flavour with a very mild hint of almond. It’s sweet, but not overly so, and the dominant taste is “fruity”. Over New Year, it featured in place of cassis in a glass of champagne under the moniker of the “Sloe Gin Fizz Royale”, lending a pinkish blush and delicate “something” to the champagne. Later, after food and fireworks, it was sipped from glasses next to a log fire. By that stage, it was slightly warm and made a great liquor to share while everyone lazed around, chatting about the year that had passed and the year to come until the wee small hours. All in all, I am very happy with this little experiment – the results were far better than I had dared to hope for, and I’m looking forward to trying something similar with other fruit this year. If you’re keen to try making sloe gin, wait until Autumn when you get a decent haul of fruit and use this recipe. ‘Tis autumn, and lo! In the local park, there is a patch of thorny bushes that have changed from green to golden, and those leaves are now starting to fall. 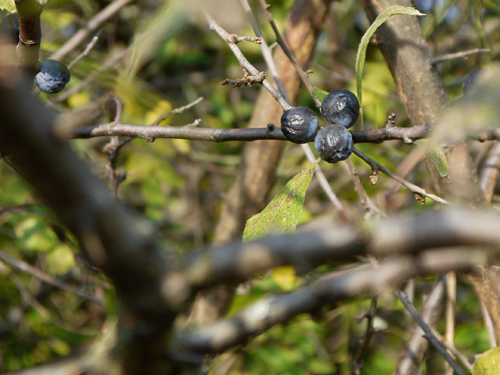 And behind those tumbling leaves…the sloes appear! Not everyone knows sloes. I make this sweeping statement based on a survey of one person. I got chatting to an American lady in the Refuel bar at the Soho Hotel last week, and she was unsure what to order. She asked me, and I suggested the sloe gin fizz, on the basis that sloe gin is very British, and it was also seasonal. She went for it and seemed happy with it. 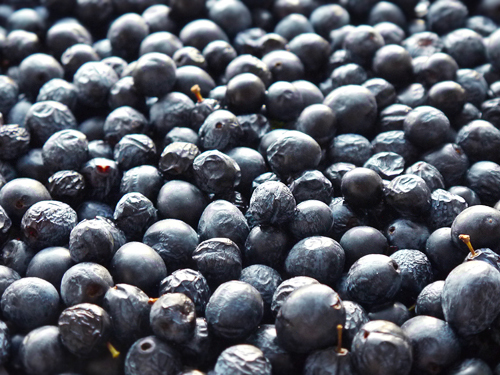 So one convert to sloe gin…but back to the point: what are they? 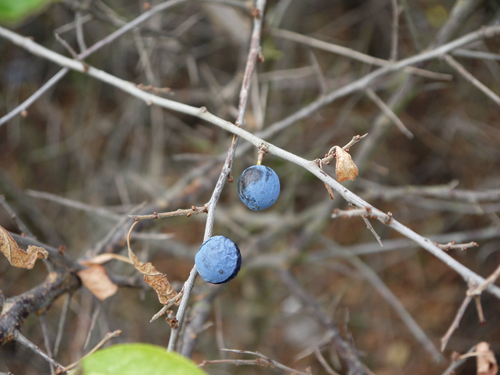 Sloes are part of the plum family, but much smaller than the varieties we are used to enjoying. They have a deep purple colour and a blueish bloom. But the real surprise is the taste. As a child, we were all the victim of someone who convinced us to taste one, only to recoil in horror as you realise that sloes might look nice but they are unpleasantly astringent. It’s like eating alum. Your whole mouth goes dry and your mouth puckers. The whole thing is…well…just downright horrid. And from that point (typically aged seven or so) you learn to avoid the little devils, no matter how ripe and juicy they might look on the tree. And then, in due course, you play the same trick on your friends and younger cousins. Well, you avoid them, unless you are me. So, I got my sloes. I picked them, froze them, and then chucked them into a pot. I made the jam and it set to a fabulous garnet colour. The next morning, I settled myself on the sofa with a cup of tea, the Sunday papers and several slices of hot buttered toast with a generous spreading of sloe jam. At first, it was quite nice, a like damson jam. Then it hit. The pure, pure horror. This is all a very roundabout way of bringing me to the issue of today’s post: how do you solve a problem like the sloe fruit? Well, there is one option which is perennially popular tipple in Old Blighty. You take the little chaps and immerse them in alcohol. Yes, I’ve made a batch of sloe gin. To get all technical, this is not really a true gin, but more like a fruit liqueur based on gin. 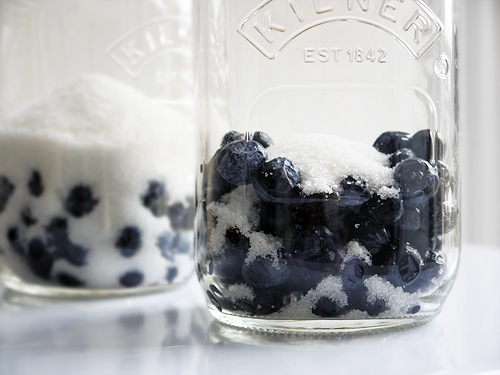 The idea is very simple indeed – you just take some large glass jars, fill them with fruit, sugar and alcohol (gin or vodka) then leave the flavour to infuse. After about a month, the alcohol is drained off and left to mature, while the fruit can be used for pies or jam. 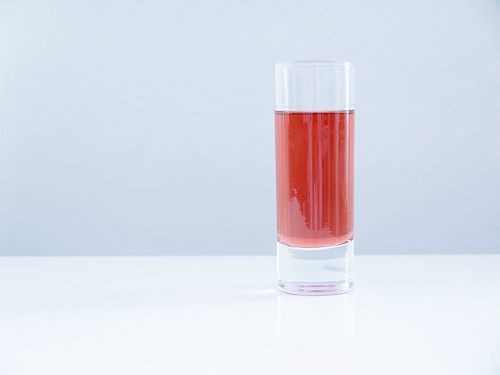 The sloe gin itself can be enjoyed neat to ward off the chills outside, or used in a range of cocktails (sloe gin & tonic or a sloe gin fizz). As with so many traditional recipes, this is one that contains its own little rituals. You should pierce the skins of each sloes two or three times either with a silver needle or a thorn from the sloe bush. Now, I don’t have silver needles lying around the house, so I toyed with the idea of going back to the wild part of the local park to get a thorn. However, I thought better of it. I had picked them with three friends and we all emerged with large cuts in our arms and legs (nothing serious, but they looked dramatic). You see, the sloe bush is also known as the blackthorn, and as you can see from the top picture, there are some vicious looking thorns on the bush. So all things considered, it was safest to use a cocktail stick. The recipe is actually quite easy – take a clean jar, fill one-third full with sloes. Check the weight of the sloes, and add three-quarters of that weight of white sugar. Then top up the bottle with gin or vodka, and shake gently. Then you shake the bottle every day for a week until the sugar dissolves, then shake it two times a week thereafter, and after a month, remove the sloes and store the sloe gin somewhere dark to mature. As you can see in the picture below, the gin starts to take on the colour of the sloes straight away. I write this on day four, and all the sugar has now dissolved and the colour is now a deep pink colour, which should become stronger with time. So for the time being, this is tucked away in a cupboard. Let’s see what it’s like by Christmas! Update: you can see how it turned out here! Rinse the sloes and remove any bruised fruit, leaves, stalks and insects (yup, there will be some in there!). Put the sloes into a tub and leave in the freezer for a couple of days. The night before making the gin, remove the sloes from the freezer. Spread them out on a plate or a try, and leave somewhere cool to defrost. The next day, pierce each fruit 2-3 times with a needle or a cocktail stick. If you’re making a lot of gin, this is best done sitting at the kitchen table with the radio on as it can take quite some time. Fill the jar one-third full of sloes. Weight the sloes, and add 3/4 of the weight in sugar. 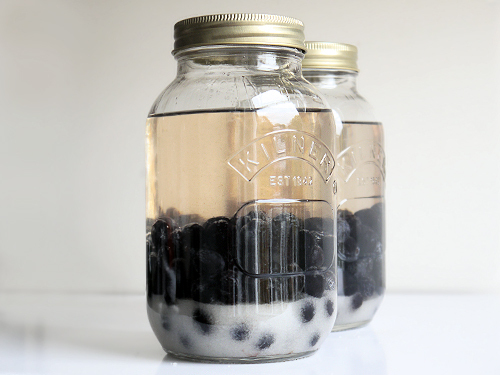 Fill the jar with gin or vodka, seal the jar, and shake gently. Store the jars in a cool, dark place (the back of a cupboard is ideal). Shake the jars gentle each morning and each evening for a week, then shake them twice per week for the next three weeks. After a month, strain the gin and decant into a sterile bottle. I’ll keep an eye out for some ideas for the boozy fruit! Worth making? No idea. Normally I would be in a position to say that I made something and it was either amazing or awful. But not today. This stuff will take a while to develop, so you’ll just need to remain patient and check back in a few months. But I’m quietly confident and expect rather great things from this. Fingers crossed! A few days ago, it was baking hot outside – 30° here in London – but as we all knew, it was not going to last. We had hot days and warm evenings, but the mornings were crisp and cool. We knew we would be shivering under coats and scarves in a couple of weeks, and the seasonal produce has been providing a pretty clear steer as to what is coming. And now it is indeed autumn! Leaves are turning and people are turning to cosy pubs with log fires. At this time of year, there are also plums everywhere, so time to enjoy them before they are gone. I had a lovely bag of purple-blue Marjory plums sitting in the kitchen, but I’ve been so busy in the last week with work and travel that they were not being eaten. Slightly past their best to enjoy as they are, I decided to make a compote with them. 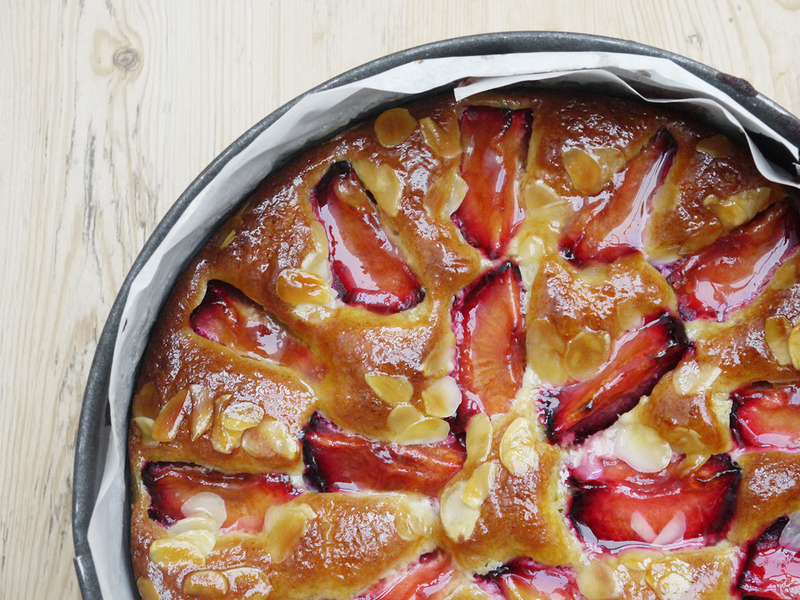 It’s the perfect way to use fruit – very easy to make and still allows the flavour of the fruit to shine through. And making compote is just as magical as making jam – the golden flesh and dark skins of the plums were transformed into a deep ruby compote. Try it with Victoria plums and it turns a vibrant red. Mirabelles will turn into deep amber. Just like the colour of the leaves! In a nod to the long-expected-and-now-here autumn weather, I made this recipe even more seasonal by using a good dash of my famous German Lebkuchen spice mix to add touches of cinnamon, cloves, aniseed and ginger. Compote is simplicity itself. Fruit, sprinkling of sugar, a little water and leave to cook for simmer for thirty minutes. Job done. In my version, I just de-stoned and sliced it into quarters. I like the strips of skin which curl up and seem to become candied in the compote, but if you like a smoother compote with fewer “bits” you can of course chop the fruit into smaller pieces. Finally, I planned to keep the compote for a few days to eat on yoghurt for breakfast, so I added one of the pits from a plum stone to the compote to give a hint of almond flavour. They are small but strong, so be warned – just the one will do it! Compote on yoghurt is delicious and a classic pairing, but of course do not limit something so delicious to breakfast. It is great on pancakes or ice cream, but it makes a truly excellent addition to chocolate – try a cake with a decent side of spicy plum compote and tell me that does not serve as the perfect antidote to cool days and chilly evenings. 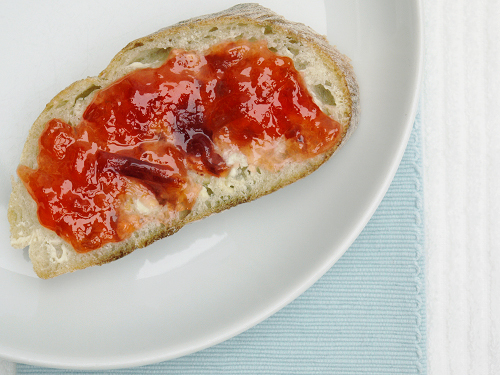 This also makes a lovely quick and easy jam for the impatient to spoon onto warm scones. No messing around with pectin, setting points or sterile jars. It doesn’t last as long as proper jam, but chances are that it is not going to last long enough for that to ever be an issue! Rinse the plums and remove the stones. Cut into pieces (small or large, according to preference). Add the sugar, water, spice and kernel from one plum stone. Bring to the boil, then reduce to a simmer for 30 minutes, or until the fruit has collapsed. 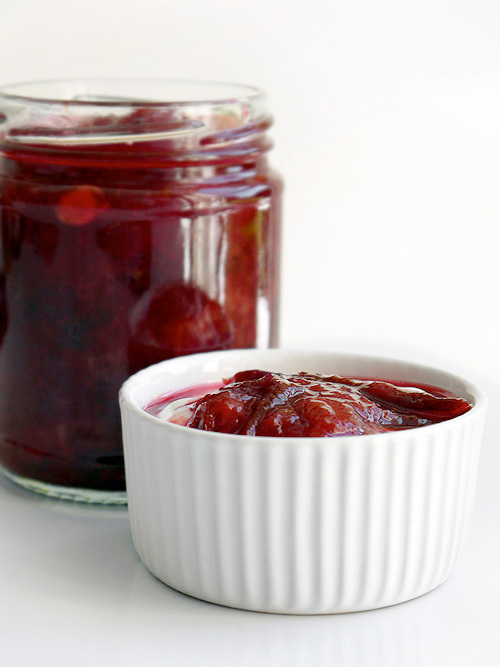 Mash the fruit slightly with a fork, then either serve as a sauce or store in a jam jar in the fridge for 2-3 days. 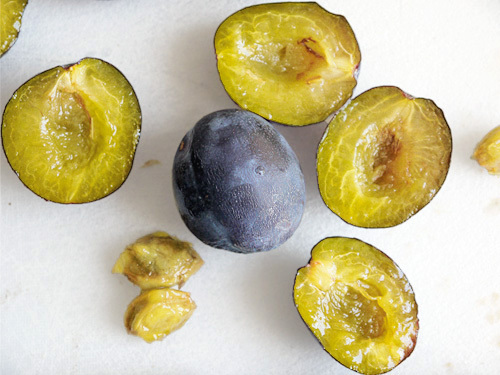 (*) For damsons, use 10g sugar per 3-4 plums, and for mirabelles, use 10g of sugar per 5-6 plums. Err on the side of caution, you can always add a little more sugar. And beware – do not use sloes for this recipe! Worth making? This is the flavour of autumn! It is full of flavour, tangy yet sweet, and rounded off by the heady, rich aromas of spices that provide the hint of warmth when it’s chilly outside. 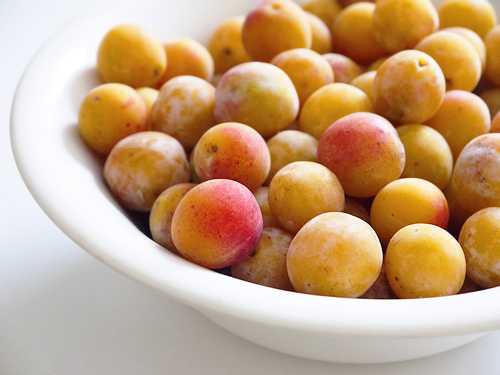 I recently became the proud owner of a pile of mirabelle plums. They looked so cute – a rich golden colour, tinged with crimson, and the size of cherries. They are the sort of fruit that you can pop into your mouth one after another, absolutely delicious and so sweet. The sort of fruit that is also lovely in a tart! After eating a couple of them, an odd thought struck me too – as sweet and sunny as they were, this was also another sign that summer is drawing to an end. Sure, we’ve been drenched recently, and at work we have gathered around the window a couple of times to debate if it is raining or sleeting. But then, the next day, the weather improves and we enjoy a couple of warm September days. While the weather is busy flip-flopping, and I am debating whether it’s a day for just a shirt or full winter jacket plus scarf, there is no doubt that the new produce in the shops does mark the steady march towards Autumn. You know that before long, the mornings will be getting cooler, the evenings longer and darker, and those occasional downpours will go from the exception to the norm. I do actually very much like Autumn – there are few things that can beat a walk in the woods with the leaves turning, especially the damp forest smell of wet leaves in cool sunlight. 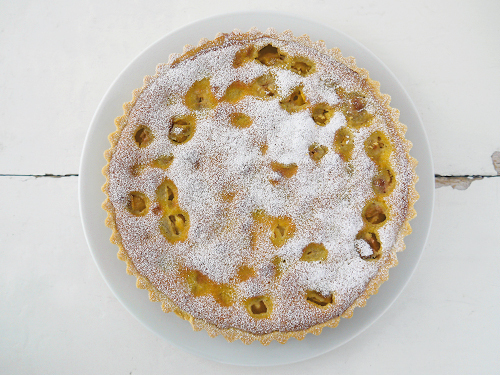 So as we move into this season, here is a little tart to celebrate the last of the summer goodies. This really is a very simple version of the classic French dessert. 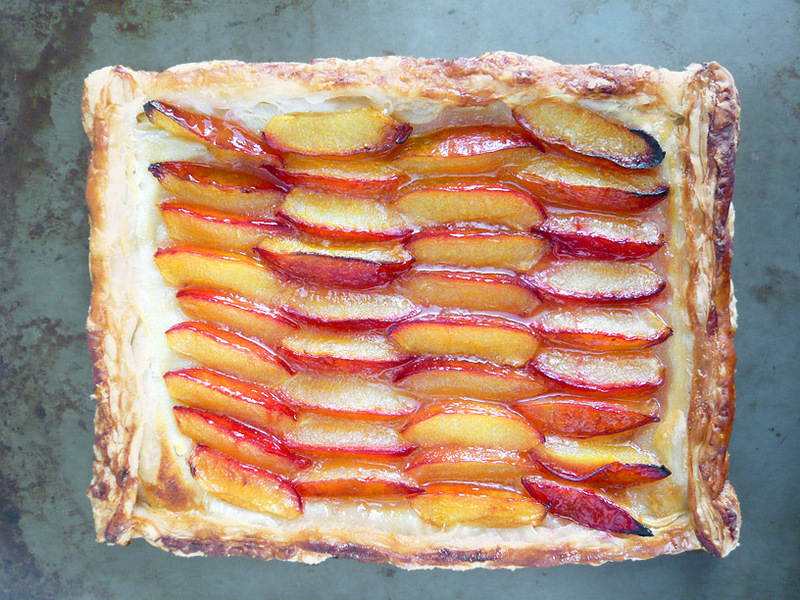 There are a few different versions, ranging from something akin to a clafoutis (just drown the plums in custard and bake), to pastry shells with varying amounts of fruit and custard, to simple galettes with sliced plums arranged on puff pastry and permitted to shine without much additional fuss other than a light sprinkling of sugar. This version involves a pastry shell, but I have used a high proportion of butter and a little baking powder, which makes it very light and crumbly, more like a shortbread than a pastry. This balances the filling – sweet, juicy mirabelles, enrobed in a custard-like filling of cream, sugar and eggs. To complement the plums, I added the lightest hint of vanilla extract and almond extract. Completely optional, but they add a nice background note. If you do add them, use with restraint – too much will overpower the fruit. 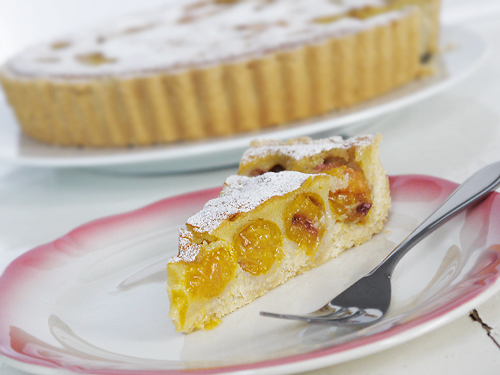 Of course, mirabelles are not a very common fruit in Britain, so the chances to make this tart will be rather limited. However, fret not. I would be willing to bet that this would also work very well with cherries. But no promises – I’ve yet to try that variation. This recipe relies on the fruit to provide sweetness – if you prefer your desserts to be on a scale than induces a sugar rush, then by all means tweak the quantities in the custard filling. Also do taste the fruit – it the plums are not so sweet, then add more sugar. Spices may also work rather well – a touch of cinnamon or cloves, each of which goes wonderfully with plums. 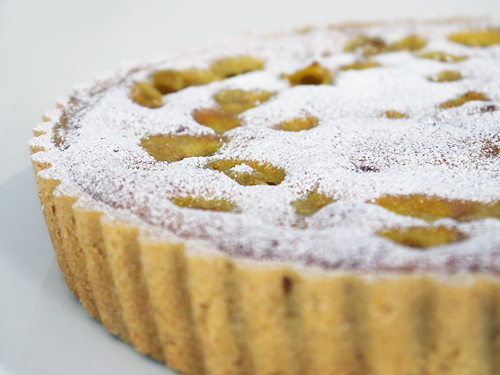 To finish the tart, you can either leave it as it is or dust very lightly with icing sugar. 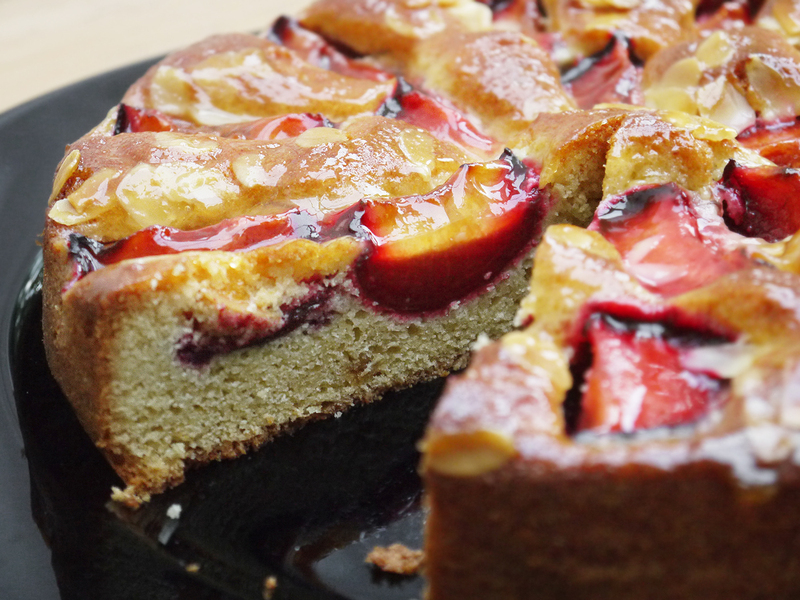 This works really well, as where the plums as peeking out of the filling, the sugar dissolves, showing off the bright orange colour of the fruit. Ah yes, oranges and golden browns. These are shades that we will be getting very familiar with over the coming weeks. Autumn is almost here, so time to dig out the scarves, winter jackets and gloves, and start enjoying long walks in the forest. And look forward to a slice of tart when you’re back indoors. Cut the butter into cubes. In a large bowl, rub the butter into the flour and baking powder until the mixture resembles breadcrumbs. Mix in the icing sugar. Keep working until the mixture forms a soft dough – if necessary, add teaspoons of ice-cold water to help the mixture bind. Wrap the pastry in cling film and leave to chill for 30 minutes. Roll out the chilled dough and use to line a 20cm (8 inch) loose-bottomed flan dish. As the pastry is very buttery, you might find you end up cutting it into pieces, then patching it together in the tin and pressing together with your hands. Try to get the pastry to just over 1/2 cm (1/4 inch) thick – you probably won’t need all of it. Prick the base with a fork, and bake in the oven at 180°C for 10 minutes. 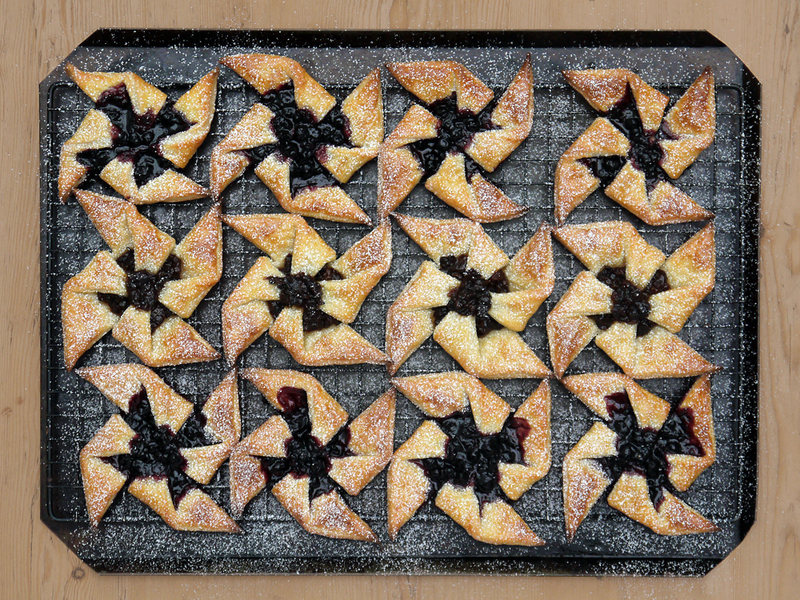 Arrange the de-stoned mirabelles in the pastry shell. In a bowl, mix the remaining ingredients until the mixture is smooth. Pour over the fruit. Bake for a further 30 minutes at 180°C (350°F) until golden on top. (*) To de-stone: either cut in half and remove the stones, or use a cherry pitter to remove the stones. Or alternatively, leave the stones in and warn your guest to eat with caution! Worth making? 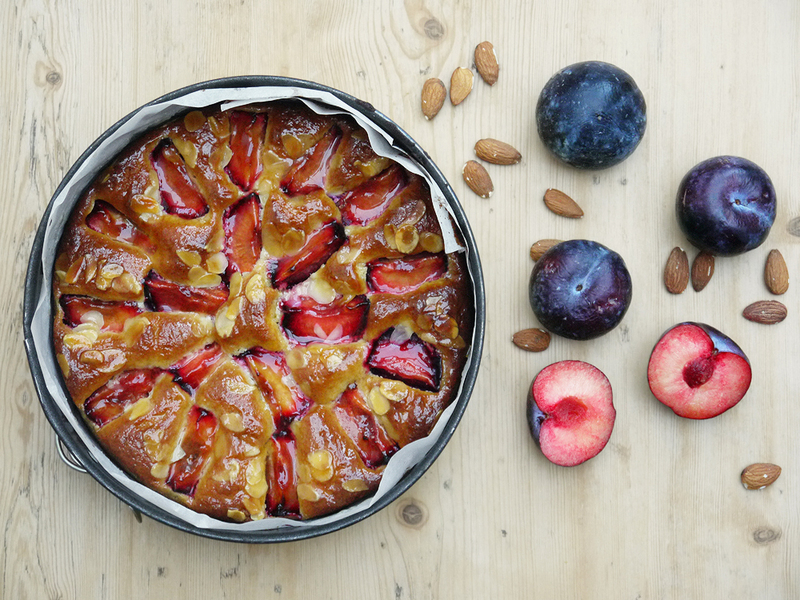 I won’t lie – de-stoning mirabelle plums is not much fun, but this is actually a relatively simple tart to make, and one which does look great when served. The whole plums peeking out of the filling also look very impressive. 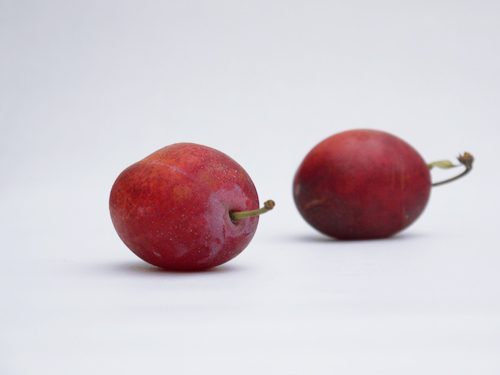 I was overjoyed to find a punnet of Victoria plums on a farm stall at the weekend. I saw them, charged over, possibly skipped the queue and made them mine with a minimum of delay. All this because it is a fruit of which I have very fond memories. In the house where I grew up, we had a Victoria plum tree, and year after year, it provided a magnificent yield of sweet yellow-fleshed plums with red skin. As a child, these were also pleasingly large, and there never seemed to be any question about us not being able to eat as many as we could manage. The usual answer when I have plums would be to make jam. Victoria plums produce a lovely russet-coloured preserve, but I have a bit of a glut of the sweet stuff at the moment. Something else was called for. 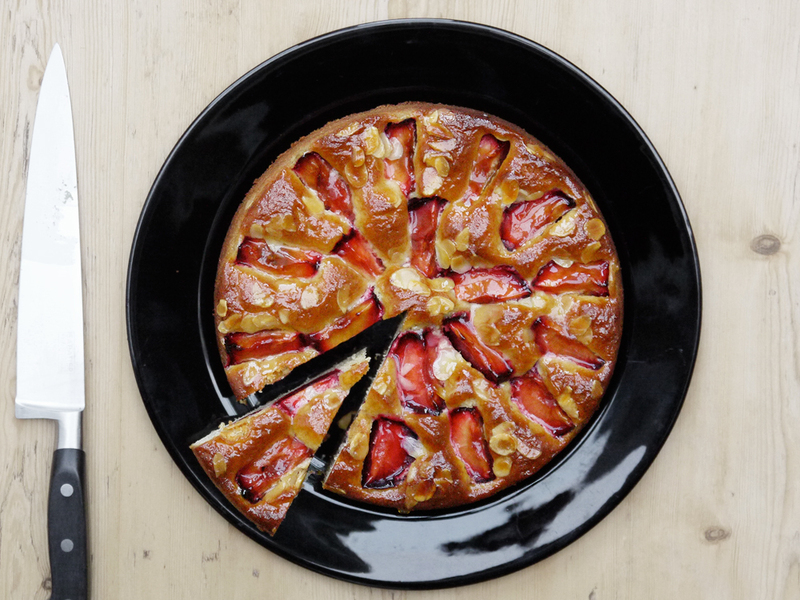 What about something everyone likes, a fruity French tart? 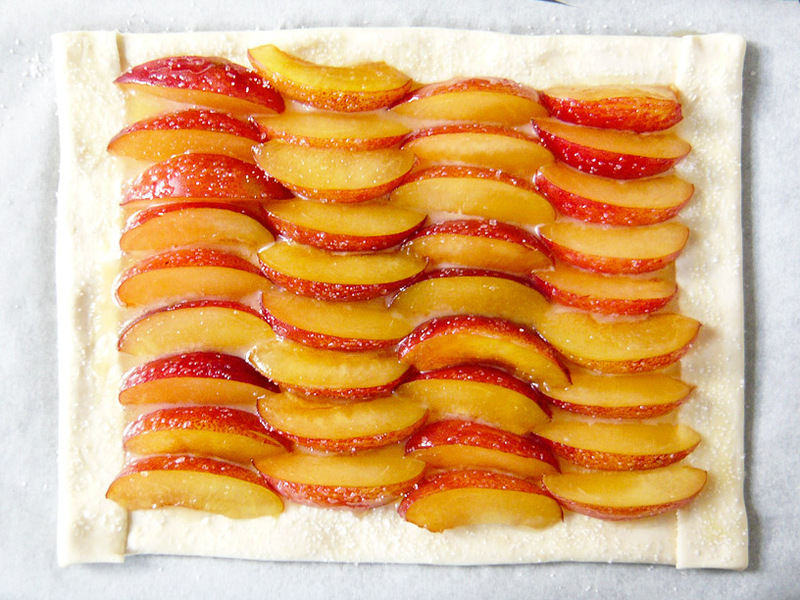 Okay, sniggering aside, a great way to prepare fruit is a simple puff pastry base, pile on the fruit, and bake in the oven. Assuming the fruit was photogenic to start with and you have been a little bit artistic in how you arrange the fruit, you get a chic/rustic tart. The great thing about a fruit galette is that you don’t have to put in much work to end up with a spectacular looking (and tasting) tart. I’m a busy person, and I don’t make puff pastry. I do know the theory and I can make pretty good puff pastry, but I am also quite happy to buy one of the excellent all-butter versions that you can buy. There, I’ve said it, and I’m not embarrassed! 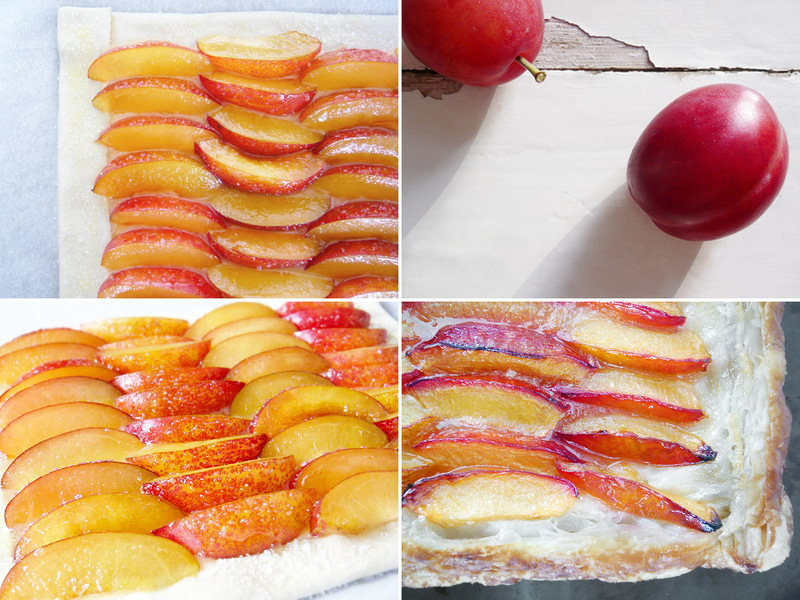 Just prepare the pastry base, fold over the edges (which have the dual function of creating a pastry “frame” for the fruit, and stopping all the fruit juices seeping out and creating a big, sticky mess in the bottom of your oven), then fill with fruit of your choice. Plums work well as they also look attractive when laid out in the centre, but equally dramatic results come with apple, gooseberry, cherry or blaeberry (one I plan to make in the near future). 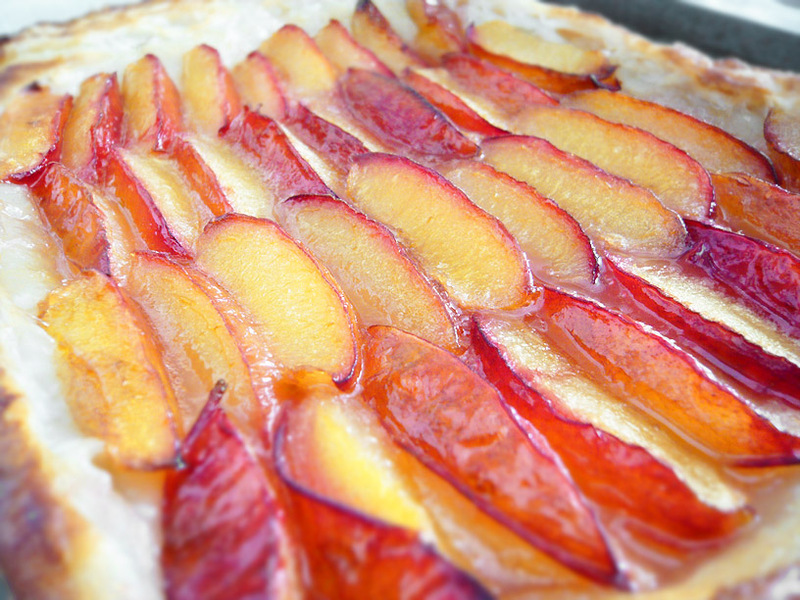 In my version, as the plums I had were very ripe, I didn’t want the tart to be overly-sweet. I just brushed the fruit with a little orange blossom honey and baked. The result was sublime. The fruit does not become sweet, but keeps a little kick of tartness, which is something that I very much like when eating this sort of baked fruit item. A wondeful combinaton of colour, fragrance, flavours and crisp butter pastry. Somehow fitting for that most regal member of the plum family. Melt the butter in a saucepan, and put to one side. Roll the pastry into a large rectangle. Transfer to a baking sheet, and fold over 2cm on each edge and press lightly. Brush the centre with the melted butter (use about half of it). Cut the plums into eighths. Arrange on the pastry, alternating the direction in each row (see the picture). Add the honey to the melted butter, heat and stir well until very runny. 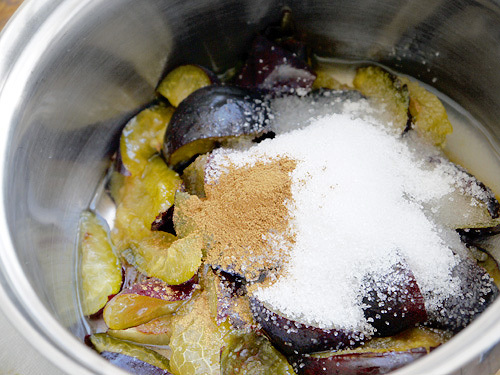 Brush the plums with the honey-butter mixture and sprinkle the granulated sugar over the plums (avoiding the pastry). Place the galette in the fridge to chill for 30 minutes. Preheat the oven to 220°C (425°F). Transfer the galette from the fridge to the oven and bake for 10 minutes. Reduce the heat to 200°C (390°F), and cook for another 30 minutes until the pastry is golden and the fruit looks soft and dry on the surface. Worth making? This is a really great and really easy dessert. Quick to make, and easy to play around with the type of fruit you use to suit what you like. Surely worth trying.